After suitable modifications, it appeared in the MG Magna. Like the Midget, it was given twin S.U. carburettors, a special alloy valve-cover and sump, and other modifications. Pundits claim that the engine side cladding-panels - as fitted to luxury cars at the time - were used to disguise its provenance. The truth is that Wolseley produced the castings for all MG engines in the '30s until the Morris unit of the 'T' types, as well as many other items used in MGs such as gearboxes. MG added numerous parts to differentiate the marque but it was a lot more than 'badge engineering'! Wolseley had a good reputation before the takeover. They had produced Hispano-Suiza fighter-plane engines in the Great War - the external vertical drive for the overhead camshaft may result from that design. 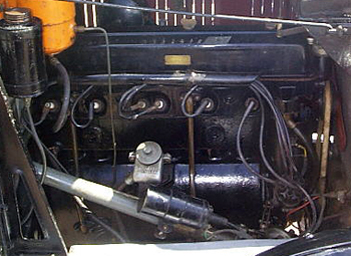 MG developed the engine in different ways from Wolseley and kept that feature. The Wolseley Hornet 'Special' and MG Magna were aimed at similar customers and William Morris disliked in-house competition. The sporting potential of the Wolseley was discouraged in favour of MG. The Hornet was still a success, and 'F' type owners would later be thankful as early 1271cc engined cars would be a useful source of second-hand spares.